For more than seventy years, beginning in 1939, when he penned his first play, Wharton Dance, Horton Foote was regarded as one of America’s most revered dramatists. With his probing and perceptive dramas, he succeeded in charting the landscape of small-town America while creating classics of modern theatre and film that have found devoted audiences around the world. Foote wrote more than a hundred plays and screenplays for cinema, theatre, and television, and was equally successful in all three mediums--a record of variety and productivity unmatched by any other writer. Inspired by his hometown of Wharton, Texas, Foote wrote timeless tales of family, home, and the mysterious resilience of the human spirit that garnered him dozens of prestigious awards, including an Emmy for his adaptation of Old Man, Academy Awards for To Kill a Mockingbird and Tender Mercies, a Pulitzer Prize for The Young Man from Atlanta, as well as a National Medal of Arts. Horton Foote was, in the words of Robert Duvall, the great American voice. With a foreword by Hallie Foote, this biography is the most thorough and comprehensive to date of American dramatist Horton Foote. 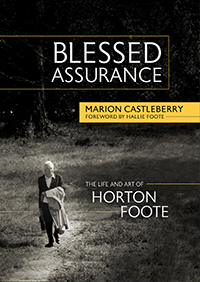 Drawing on the author's complete access to Foote's personal papers and extended conversations with the writer, his family, and his friends, Marion Castleberry discusses all the important aspects of Horton Foote's life and career--his Wharton, Texas childhood, his devotion to family, his deep Christian faith, his abiding passion for the theatre, and his successes as a screenwriter and independent filmmaker. While placing Foote's work in biographical context and offering insightful analyses of his works, Castleberry paints a striking portrait of the artist as well as the man.